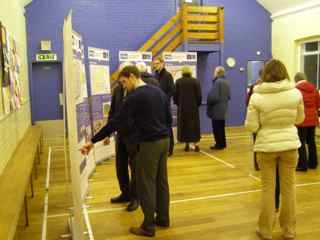 There was a steady stream of visitors at the Wing Drop-in at the church hall yesterday. Members of the Planning Team from South Cambridgeshire District Council were on hand to explain more about the outline plans for the 1300 new homes on the Marshall's site known as Wing. There was a more formal meeting of the Cambridge East Community Forum the previous day, which went into more details, but the drop-in allowed a more one-to-one conversation with the planners.